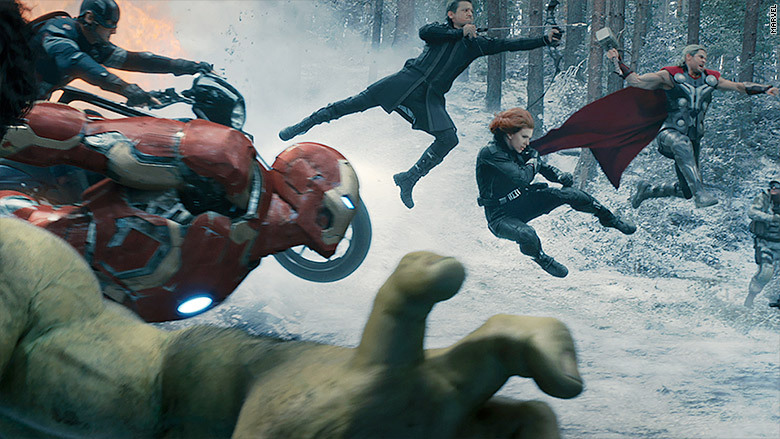 "Avengers: Age of Ultron" will fly pass $1 billion at the worldwide box office on Friday, according to Disney. It didn't take very long for "Earth's Mightiest Heroes" to total one of Earth's mightiest box offices. Disney (DIS) and Marvel's "Avengers: Age of Ultron" will pass the $1 billion mark at the worldwide box office on Friday, according to Disney. This means the mega-blockbuster will pass the milestone on its 24th day of being released globally. For Marvel, this is the third film to break $1 billion worldwide since 2012. It joins the global hauls of its predecessor 2012's "The Avengers" which raked in $1.5 billion and 2013's "Iron Man 3" which made $1.2 billion. For Disney, "Ultron" becomes the eighth film in the company's storied history to pass the billion mark. The other seven are 2010's "Alice in Wonderland," 2011's "Pirates of the Caribbean: On Stranger Tides," 2010's "Toy Story 3," 2006's "Pirates of the Caribbean: Dead's Man Chest," 2013's "Frozen," and the two Marvel films already mentioned. The film, which opened domestically on May 1 to the second largest U.S. opening ever, will also become the highest grossing film of the year in the U.S. on Friday when it passes "Furious 7," according to the company. As impressive as it is for "Ultron" to cross the $1 billion threshold, it did lag behind the original Avengers film which needed only 19 days to cross into billion dollar territory. And the House of Mouse is just getting started. The company's big summer at the box office continues with "Tomorrowland" next week, Pixar's "Inside Out" in June, and Marvel's "Ant Man" hitting theaters in July.